also beneath the finger nail (subungual melanoma). A streak of pigmentation beneath the nail may occasionally be a precursor, but it may also be innocent. 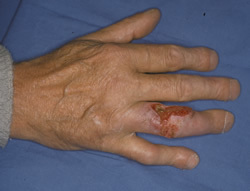 Melanoma is treated by wider removal than other skin tumours, and may require partial amputation of a finger. Other skin tumours (basal cell carcinoma and squamous cell carcinoma) are treated as they would be elsewhere on the body. arouse suspicion, especially in young people. Deep fixation of a tumour is a worrying feature. If there is any doubt, an MRI scan should be carried out first to show the position, attachments and consistency of the tumour. Then accurate diagnosis must be established by biopsy and pathological examination. Then a plan of treatment appropriate to that diagnosis must be arrived at by a multidisciplinary team with expertise in surgery, radiotherapy and chemotherapy. This is a very complex area. Some sarcomas can be effectively treated provided the right choices are made, but some recur or spread, and inadequate early treatment is an important contributing factor to this. Malignant bone tumours are similarly complex and need expert planning and treatment. They are rare within the hand.